I have had the MX5 for about 2 weeks now. Until now I have had no experience with Whites machines. I was able to get this one as a demo for 250.00 off the list price, which made picking it up a no-brainer after all the good reviews I had read. The MX5 is an amazingly easy machine to use. Compared to the F70 or F75 it is night and day difference. The Fishers, while amazing machines, cannot match the ease of use of the MX5. The main feature that I find helps locate coins better than the Fishers is the 8 tone vco(Voltage Controlled Oscillator). This is the same feature that gives Minelab machines that high pitch singing sound when it hits silver... and makes recognizing good targets a breeze. I have no idea why Fisher has not put the 8 tone vco on their flagship machines. It's an amazing feature. If this machines is a good indication of what Whites has to offer, I see why so many swear by them. The feel is solid. The sound quality is superb .... full and clear. Despite weighing almost a pound more than the Fisher F75, the perfect balance of the MX5 makes it feel much less heavy than the F75 in actual use. I do not even have a need to use the arm strap. In beach mode the MX5 performs very well on wet sand at the local lake I hunt at. I was easily able to hit 5 inch targets with the tiny 4x6 inch dd coil on it. I need to try a larger coil to get the maximum depth this machine is capable of. With a nice array of Eclipse line Whites coils available, the machine can definitely meet any challenge I could ever throw at it. No buyers regret here... The MX5 is a great little machine. This is one serious detector and I think the best bang for the buck! On my first day I hit on a 1871 3 cent silver piece in VG + condition and a very rare find that's a $500 coin!!! In a local park ran over by tons of people... Fact is that my Minelab X70 and Quattro missed before and I love this machine!!! Whites hit a home run out of the park when they put this super deep easy to use machine that's a digital platform of the MTX series. Try a 8x6 coil for those trashy area's and the standard coils also does the trick! Can't wait till next season cause I know this excellent machine is going to make the best out of every sweep! I love this machine!! Back in the 80's I dreamed of a TR detector with constant threshold, ID, and ground balance. I got it in the mx5! I don't even use the pinpoint mode-it's so fast. I'm again finding 8" coins like when I had the CZ5. I have been detecting since 2003 and have owned the ATPro, Etrac, CTX, Xterra 705, Silver uMax, Vaquero, Tejon, and the Omega. The MX-5 is by far my favorite machine of all that I have used! The balance is perfect and everything is well laid out on the controls. The backlight is very nice for early or late hunts. The standby mode is very nice to silence the machine while retrieving targets. Many users have complained about the headphone jack being on the right side of control housing. It has not caused any problems for me while using it. The thing I like the most about the MX-5 are the sweet audio tones! I use 8 tone for coin shooting and 2 tone for trashy, iron laden areas. The machine is very good at un-masking good targets in heavy trash using 2 tone audio. I really like the pinpoint lock so the button does not have to be held while pinpointing. Switching to the true all metal mode is very easy by just holding pinpoint button down momentarily. The Whites threshold is superb and my favorite even over Minelabs. If you are considering this machine or the ATPro, there really is no comparison between the 2. In this price range and even machines costing twice as much, the MX-5 is a great value! Based on the MXT, the MX5 is a great affordable machine. Killer on nickels (18-20 VDI almost 100 percent of the time), deep and durable. Only wish they would've put the headphone jack on the left side, or somewhere in the center as the headphone cable drapes across the display. 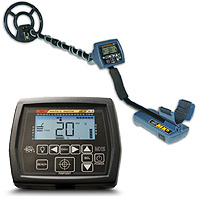 I get very insecure when I hear other detectorists rave about their ATPros, $1800 E-Tracs, etc. And they try to make me feel inferior with my MX5 but I'll tell ya, I've been doing this 30 years and know when a machine is good and the MX5 is a darn good machine. Can't wait to go hunting with the 'big boys' (I AM a big boy, very experienced) and see if they find anything I don't with the MX5. Highly doubtful. Trick is turn up the sens til it crackles, set the threshold low, knock out -95 to 0 and use a moderately slow sweep speed. When you hear a consistent tone, check it! If it's repeatable and in the coin range, DIG! When in doubt, dig it out! The MX5 is solid and feels stable when swung. While it's not as light as some detectors, it is VERY well balanced. I can go for hours swinging this detector. One of the things I like about White's products is they DO have a little more bulk. They just feel very well built. The MX5 is very comfortable. The Fishers I've had (good machines too) felt floppy and cheap. I use the stock 9" spider coil and a 5.3 Eclipse which does an EXCELLENT job in high-trash areas. The MX5 is fast and can easily pick out the good stuff mixed in with the trash. Definitely recommend the 5.3 Eclipse coil. Two thumbs up on the new MX5. It has just enough features for the person who hunts parks, school yards and fresh water beaches. If you are familiar with Whites VDI numbers it's a snap. 20- nickle 85- 86 quarter etc, pinpoint is dead on and it will find the good stuff with tone ID. Good job Whites, run the MX5 wide open, sensitivity as high as the area will allow and threshold just audible. I like 8 tones but that's up to the user. Works well with the 9in stock coil, just listen for the tones. Whites newest detector based on the mxt platform. I really like this detector. It has all the qualities of the mxtpro but in a fully digital design. Its ability to go deep with good vdi. Simple to use yet enough different settings to please most anyone. Lightening fast response makes it great in trashy areas. The mx5 is very very good at finding good targets in the rusty nail infested yards. It also uses all of the eclipse coils.Its lighter and feels very comfortable. The coil connection kinda tight. That's about it. So many good features and it performs so well makes the mx5 one of my favorite detectors.